De gustibus non est disputandum is the Latin saying that roughly translates to in matters of taste, there can be no disputes. That's all good and well if you are some kind of Roman theologian, but when the rubber hits the road at an auction, I prefer the maxim -- si carpentum abominationum, non occurrit reservare. However, these next two auctions on eBay have me totally confounded. Checkout this 1967 Mazda Cosmo here on eBay bidding for $36,501 with 1 day to go, and this 1979 Cadillac Fleetwood based "Spirit of Nemo" here on eBay bidding for $48,100 with 1 day to go (both cars have not met reserve). 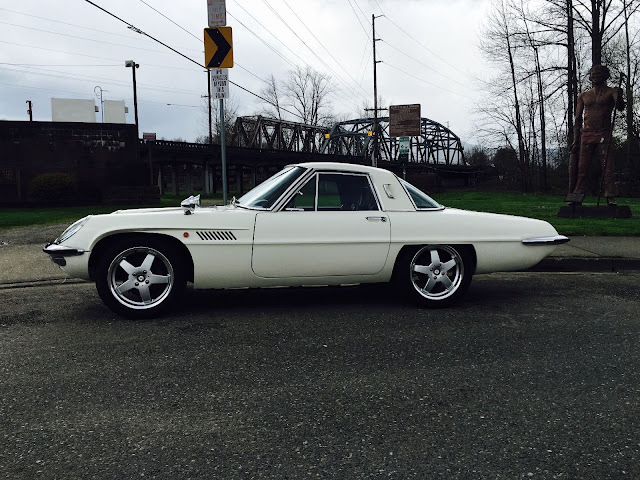 Let's start with the Mazda Cosmo -- which is a extremely rare car. Few were built and only a handful have made the trip across the Pacific Ocean, one of which is in Jay Leno's garage. The powertrain has been upgraded to a 13B rotary and 5-speed manual -- surely, this upgrade isn't the reason for the lack of bids? Countless pompous keyboard jockey's around the web might complain about the rolling stock "we'd swap the wheels to stock before driving it home for fear of having someone take a cell phone pic" but wheels are REALLY easy to remedy. And then there is the steering wheel "we'd rather dip our newborn in a bucket of zika infected feces than touch that aftermarket wheel, but we'd find an OE part to bring to any test drive" -- seriously? A steering wheel is another easy to replace component, and personally I think that this upgraded Cosmo would be a fantastic bargain if the reserve is met soon. The next car...eh...we'll get to that. This next car is bidding for $10k more than the Cosmo...which is hard to believe given it was built from a few '79 Cadillac Fleetwood limos. 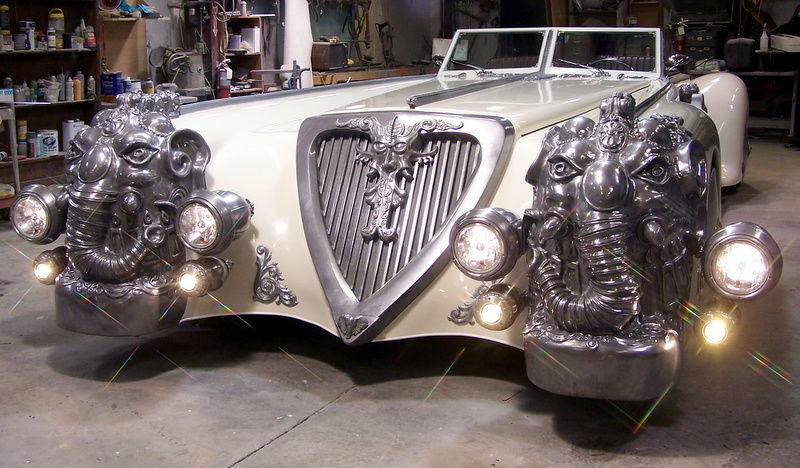 It would be one thing to jusitfy the almost $50k asking price if these was the actual movie car from the 2003 offense against taste and decency starring Sean Connery and known as the The League of Extraordinary Gentlemen. The League was extraordinary in one way -- it was panned so thoroughly by critics that over a decade later you can still hear the sizzle if you open your window and listen carefully. This car on the other hand is certainly something ...well...errr...special. The description mentions that it was built from two different Fleetwood Limos and something like 120 pieces of "sculpted" "art". The 24 foot long monstrosity took almost 6,500 man hours to build, which equals $7.38 per hour at the current bidding price. Am I off my rocker, is it insane that the Nemonstocity is bidding for $10k more than an upgraded Mazda Cosmo? The Cosmo looks a good deal. Hagerty lists the average price as $117,000. The wheels and steering wheel are poor choices, but as you say, easily remedied. The drivetrain swap would make it more drivable and usable, if less collectable. And it's probably pretty challenging to track down an original drivetrain for one of these, if that is your thing. I would put a stock-looking Mazda air cleaner over that Weber, do a little tidying of the engine bay, and call that done. Having driven a Cosmo I can see why many of the changes were made and there were a lot more changes than mentioned in the ad. This may be the reason for the low price. Still I think the Cosmo is a great looking car. That other thing. Why would anyone except the person who conceived it pay more than scrap value? I refuse to click the link for that other thing but as for the mazda, i think BTW pretty well summed it up. When a Juggalo winzz the Lotto - Whoop Whoop! I'll take the dragster! Although reserve not met and a $99K original price on the Barris custom. I'd love to show up at the DMV with that thing and ask for plates.